Even as 70% of people in India rely on agriculture for their livelihood, very few are aware of proper techniques to increase their harvest. However, thirty two-year-old Ranjan Kumar Samal of Kuanrpur viilage under Kaptipada block of Mayurbhanj district has some different and inspiring tale to narrate. The young farmer is different because he could enhance his income to a considerable level. He intimated that he used integrated farming techniques recommended by Reliance Foundation Information Service (RFIS) experts to achieve this goal. After his graduation, the young farmer worked as a small contractor to keep the home fire burning. However, soon he felt that it was not his cup of tea. And so he was in search of a fresh job. One day he thought of tapping the available resources in his disposal. He used to spend time near a small pond close to his house feeding and catching fishes. It was a passion for him. He decided to turn his passion into his profession. 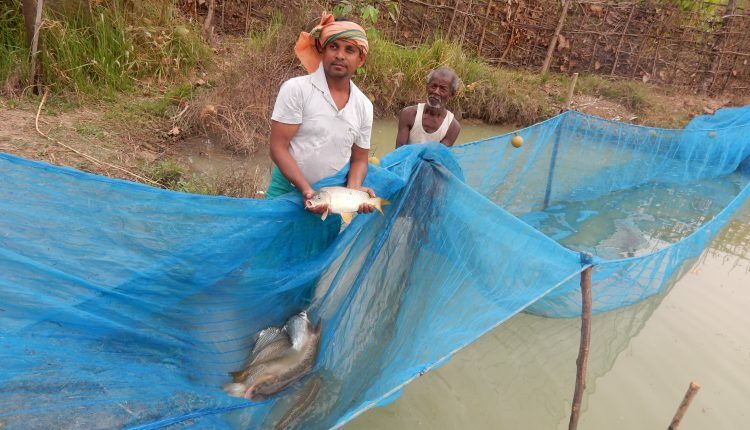 Samal contacted the block fishery extension officer and got all support and advice to develop a fish farm on his land. In 2016, he built a pond on around 4 acre on his land by investing Rs 8.5 lakh and got a subsidy of Rs 3.4 lakh. In the first year, he managed to earn Rs 2 lakh from the project and his joys knew no bounds. “Linking pisciculture with livestock, poultry and vegetable farming helps proper utilization of resources. Waste or by-product from one system is effectively recycled and available farming space is used for maximizing production. While the droppings of poultry and goats are used as fertilizer in the growth of vegetables, the unsold vegetables are used as goat fodder. The leaves, stalks and other waste products are chopped and crushed and fed directly to the fish or made compost to be used as fertilizer. And irrigation is not a problem while the pond is adjacent to the vegetable field. Another advantage is that banana and drumstick plants grow well on the bund,” Samal added. 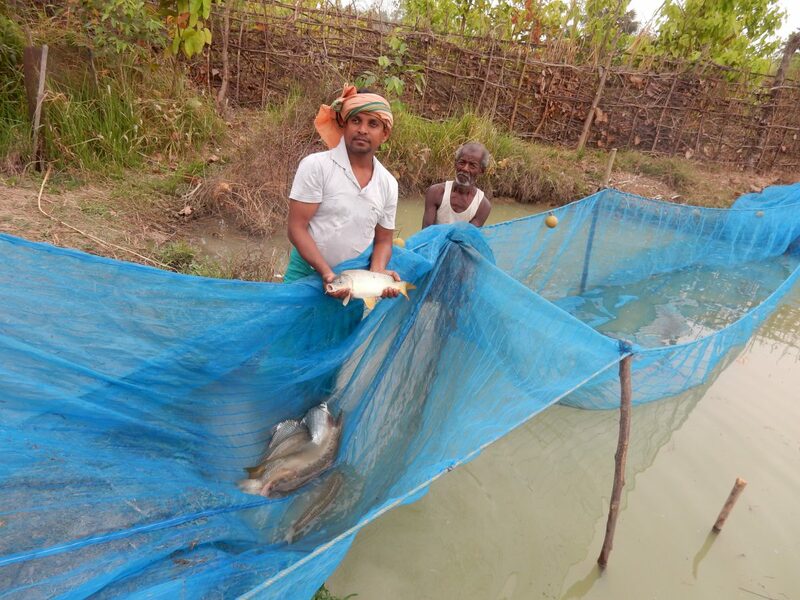 With three years of experience in fish farming behind him, this year he expects a bumper gain than previous years. Currently, his fish production pegs at 18-20 quintal per acre and he has set a target to harvest 30-40 quintals per acre in next season. Currently, he has engaged two staff at a salary of Rs 5,000 per month and will require five more hands for proper use of techniques to achieve the target. 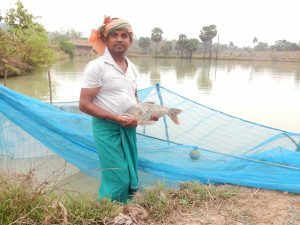 “Expert advice to control fish diseases, on fish feed and the techniques to increase production have been helping me a lot in achieving the target. While the weather advisory of RFIS helps me in vegetable farming, the advice of the experts on disease control mechanism of poultry and goats has been useful to maintain their health and production and in checking their mortality rate,” Samal said. “Seeing my success in farming, sometimes my neighbours approach me seeking advice when they face trouble in farming activities. Then I offer them some tips and share my experience. Often I have to call the RFIS toll-free number to get expert advice for my neighbours,” the young farmer said. The author is a climate and human interest story teller.